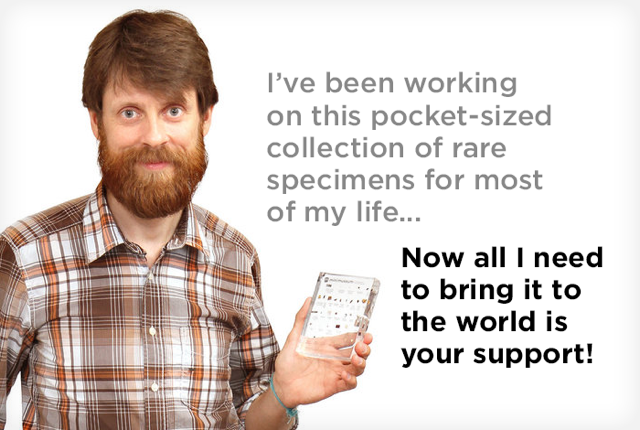 The Mini Museum is a Kickstarter project by Hanz Fex that’s attempting to create a miniature museum with more history and important artifacts tied to it than most museums around the world. It’s a block of resin that holds minute pieces of 33 artifacts that Hanz has collected over the years while attempting to create the museum. 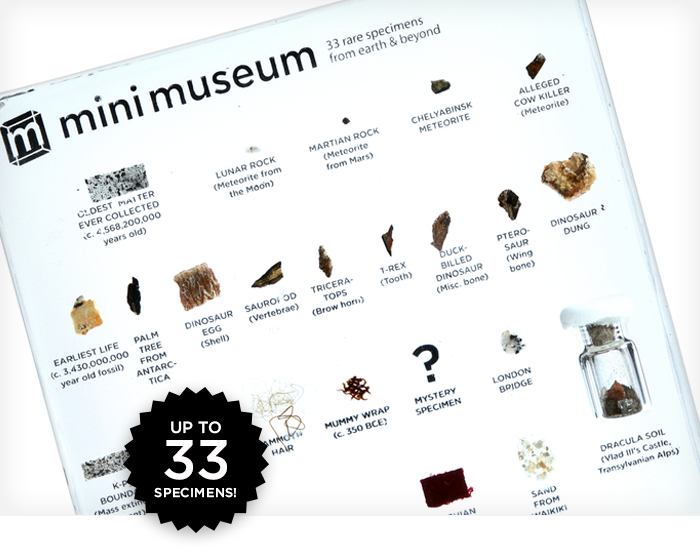 The list of artifacts includes everything from dinosaur bones to moon rocks and even dirt from Dracula’s Castle. The number of artifacts your block comes with depends on whether you purchase (or, at this point in time, donate towards) a small, medium or large block. Right now you can get a small block of 11 artifacts for $99, medium block of 22 for $179, and large block of 33 for $239. Keep in mind that this DOES NOT come with a certificate of authenticity. You have to take Hanz at his word, which seems pretty legit if you watch the KickStarter video. Each item is also listed and explained on the Kickstarter page, which can be found by clicking the source link. I’m not really interested in a hundred dollar paperweight, but I know there are collectors out there who’ll eat this right up. Hanz has already surpassed his Kickstarter goal of $38,000 by over $200,000 after all. Hell, 22 people backed him in the time it took me to write this!